FAYETTEVILLE (WTVD) -- Fayetteville police along with the U.S. Army Criminal Investigation Division are on the hunt for a sexual predator pretending to be a police officer. Police said around 5:30 p.m. on Nov. 18, the man used a flashing blue light in the dash of his four-door sedan to pull over the 16-year-old daughter of a Ft. Bragg soldier on Bragg Blvd. near Gruber Rd. on post. Police said the impersonator told the teen he stopped her for speeding. He asked her for her driver's license and registration before forcing her out of the car and into some nearby woods where he sexually assaulted her. The victim described her attacker as a white male, about 5'7", in his late 20s or early 30s and clean shaven. 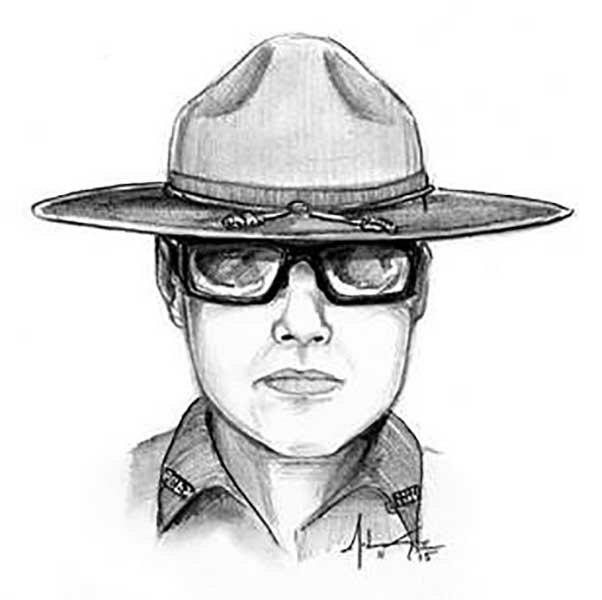 She said he wore dark pants, a grey short sleeve button down shirt with patches on the sleeves, a hat and dark sunglasses. Police also said the impersonator was described as carrying a pistol in a holster that was hanging from his pants pocket. Lt. John Somerindyke with the Fayetteville Police Special Victims Unit told ABC11 the girl was treated and released from the hospital. "Physically, she may be okay, but this unfortunately is bad psychological trauma she's going to be dealing with for a lifetime here," he said. "At least until we can try to get her some closure, which is why we really need the public's help." As police urge anyone who was in the area of Bragg Blvd. and Gruber Rd. that Wednesday evening to give them a call, officers are pointing out the differences between their unmarked police cars and a fake. "The victim actually described it - the blue light - as being right here in the dash board area," Somerindyke explained. "We don't have any in that area. All of ours are going to be mounted up in here," he said pointing to the top interior of the windshield. Also, Somerindyke said drivers should listen for a siren. "All of our unmarked units do have a siren and we will use the siren when we pull somebody over. This guy did not have a siren," he said of the impersonator. "Typically, these impersonators do not have access to a siren." If you still feel suspicious when an officer is pulling you over, police are assuring drivers it's okay to call and check before coming to a complete stop. As this suspect is still on the run, Somerindyke said all Fayetteville police officers, especially those driving unmarked cars, have been told to expect drivers' wariness. "If you're being pulled over by an unmarked car, or even if you're not sure, go ahead and get on the phone, call 911, put on your emergency flashers, get in the right lane, slow down a little below the speed limit, and go to an area that's well lit with a lot of people in it," he explained. Anyone with information regarding the sexual assault is asked to contact the U.S. Army Criminal Investigation Command at Ft. Bragg at (910) 635-1758, citizens may also email Army CID Crime Tips at: usarmy.belvoir.usacidc.mail.crime-tips@mail.mil or call 1-844-ARMY-CID. Additionally, anyone with information can contact FPD Detective Benazzi at (910) 257-3668, or Crimestoppers at (910) 483-TIPS (8477). Crimestoppers information can also be submitted electronically, by visiting http://fay-nccrimestoppers.org and completing the anonymous online tip sheet or by text-a-tip on your mobile device by sending a message to 274637 (in the text box type "4Tip" followed by your message).